A framed pièce de résistance hangs in my in-laws’ garage. It is quite large, too large for the house, and has been relegated to an uneventful venue, watching through colorful eyes the stony activity that befalls the elderly. I have passed its solitary station above the player piano for nearly 20 years, unaware of its quiet submission to the bigger, louder object. Seated on a folding envelope of canvas, my eyes recently gazed not on piano sheets, but upward to the colors, composition, and the number 55 that distinguish this magnificent lady from an ordinary girl. Of course, she is a copy, but her vigorous spirit remains. 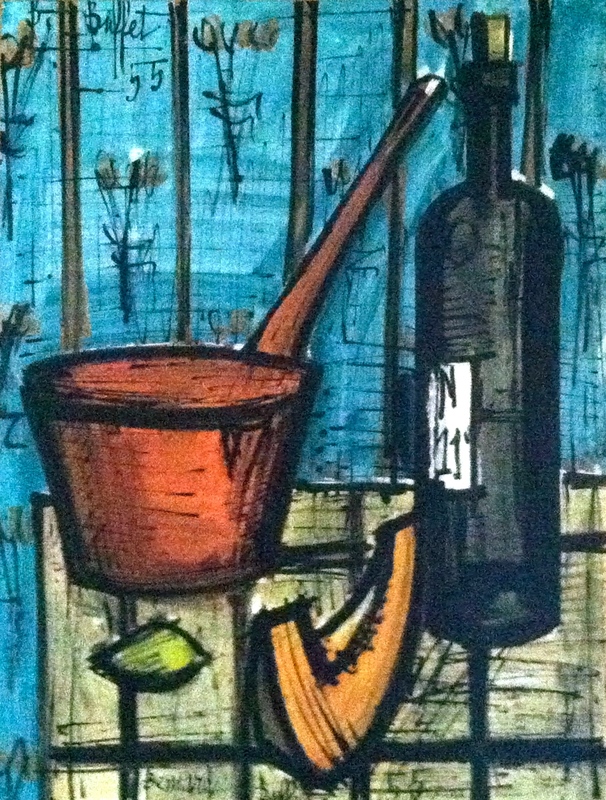 The artist is (was) Bernard Buffet, a French painter, July 10, 1929 – Oct. 4, 1999. (Happy birthday Monsieur Buffet!) The number 55 represents a collection of his, with this masterpiece and similar others insisting on a little fun. My mother-in-law was gifted the framed piece when she was a working lass (she is now 89 years young) as a food editor for The Spokesman Review. She transported the long-locked lady in the backseat of a convertible car; it was simply too demanding to travel any other way. My mother-in-law’s foodie career existed when most women her age were getting married and starting families. (Her family life began at the age of 43.) Her work included a live cooking show in Los Angeles before recorded TV existed. Among other mistakes, she started a fire on the set and had a laughing fit over “porcupine meatballs”. Clearly, she’s a woman with a desperate sense of humor. She took a work trip to France with her cooking colleagues in the day when it was mandatory for a working woman to wear skirts or dresses, nylons, and heeled shoes, and sometimes, gloves. She hated the nylons because they stayed “in place” with garters and every time she stood up the knees sagged requiring a visit to the lady’s room to adjust before accomplishing a task. Little activity happens now. The sad player piano only lifts its notes when my children play the resonant keys or pump its stubborn pedals. A sorry sedan replaces the convertible. But I just know on the rare occasion when the notes cry out and voices raise in song, this picture is dancing. Thanks so much Julie. I must pass on accepting awards as I find joy in everyone’s blog. It would be too difficult to isolate a few for recognition. Thank you for the nomination, and I’m glad you enjoy my blog. I totally understand 🙂 Basically it’s just a means of complimenting you ^^ Cheers!